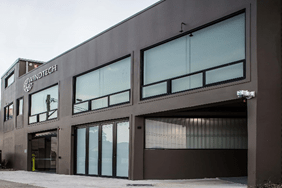 Windtech Consultants has recently relocated to its new headquarters, which incorporates its third state-of-the-art wind tunnel facility, making it one of the largest such facilities in the world. This significant milestone also happens to coincide with the company’s 25th Anniversary, so there are many reasons to celebrate. 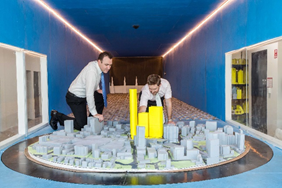 The decision to establish the third wind tunnel at its Global Headquarters in Sydney enables the company to cater for growing demand. 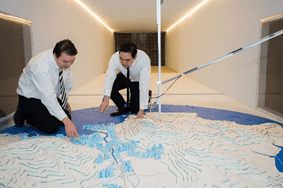 The decision to have all the wind tunnels located at its head office is driven by the need to maintain quality control over testing procedures by the specialist senior staff. Windtech offers its clients access to witness the testing either in person or live via a webcam. The company was established in 1991 focusing solely on wind engineering services and operating out of a warehouse in the Sydney City Fringe suburb of Camperdown. For the past seven years Windtech has been growing at a steady pace and currently employs over 50 wind engineers plus admin staff. 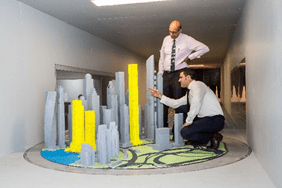 Windtech has attracted high calibre engineering staff and has over time developed a high level of expertise in all areas relating to wind and buildings. Currently, Windtech Consultants, an Australian based global wind engineering firm with projects from all around the world, has branch offices in Melbourne, Singapore, London, New York, Abu Dhabi and Mumbai. In addition to their regular studies of wind loads on tall or large building structures and façade cladding, they have developed expertise in a broad range of related areas, including air quality, wind noise, natural ventilation and wind entry, to name a few. Besides wind tunnel modelling, Windtech offers desktop methods where applicable, including CFD based flow and thermal modelling. Other studies include thermal performance rating, daylight, solar access, solar light and heat reflectivity studies and stack effects. 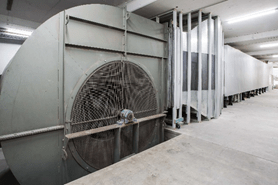 One of Windtech’s three wind tunnels has been configured to facilitate the testing of bridge deck sections, due to its ability to generate very low background turbulence by means of three air straightener sections and a large plenum. This reduces the time and cost of modifying the flow in the wind tunnel to generate the low background turbulence in comparison to other methods. Director, Tony Rofail and Associate, Dr Nick Truong are on the Australia and New Zealand Standards Committee for wind actions on Structures. Tony Rofail, who in 2001 was involved in the drafting of the original Australasian Wind Engineering Society’s Quality Assurance Manual for Wind Tunnel Testing has recently worked on the draft of the update to the same document, expected to be released later this year. Tony Rofail is also on the CTBUH Committee for Wind Engineering and Design of Dampers.